In the mid-1930s, the Henschel-Flugzeugwerke (HFW) aircraft factory was looking for a suitable location for a new plant, as the facilities used at Johannisthal Airfield were no longer adequate. Subsequently, a new airfield was built south of Berlin between Schönefeld and Diepensee. Until 1945, aircraft of other manufacturers were manufactured here under licence and Henschel's own models were developed and produced. 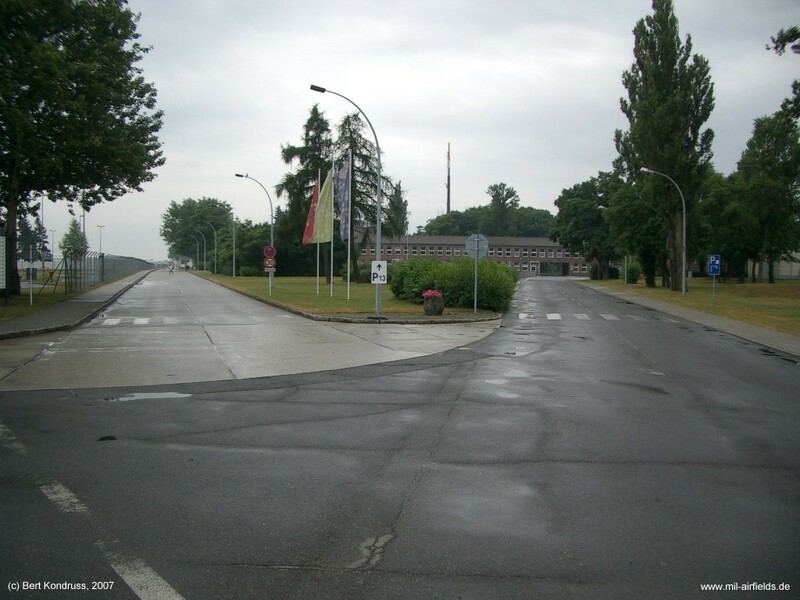 At the end of the Second World War, Schoenefeld was occupied by Soviet troops, which stationed here transport aircraft. In the following years, the first air traffic to socialist countries developed. 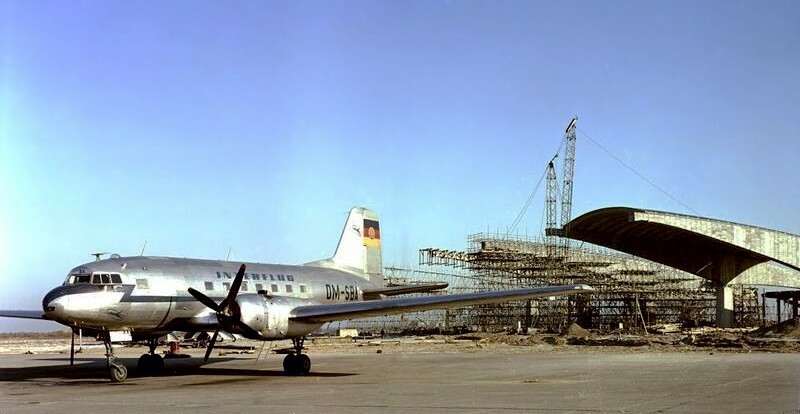 From the mid-1950s onwards, the airfield was used by the newly founded East German Lufthansa. The handling facilities for this were located at Diepensee in the southern part, while the northern part continued to be occupied by Soviet transport aircraft, which also decided about flight operations. In order to gain full control of the field, the GDR had to create a replacement for the Soviet units. 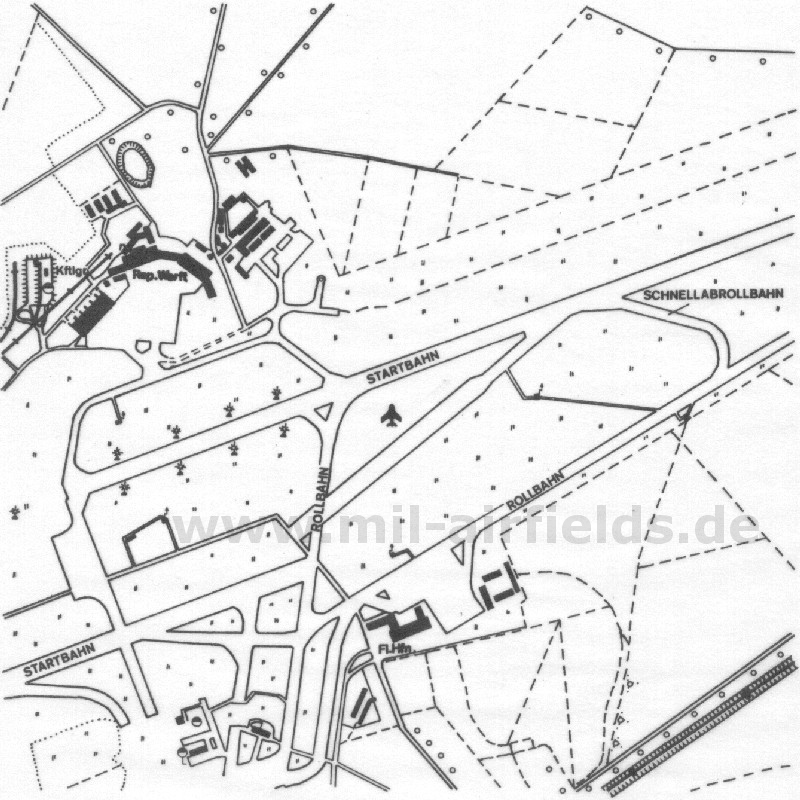 This was the newly built Sperenberg Airfield, which went into operation in the early 1960s. It allowed the East German Lufthansa and later the Interflug to use the entire facility as the "Berlin-Schönefeld Central Airport". During this time, a new runway 07/25 (later 07R/25L) with a length of 3000 m was built south of the existing runway 05/23. 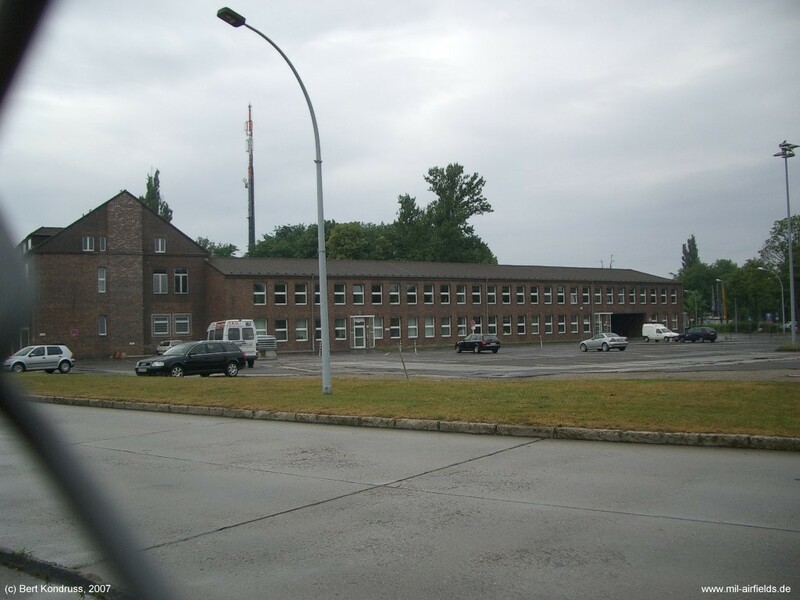 Passenger handling moved from south to north into the buildings of the former Henschel training workshop. Finally, a parallel staggered runway 07L/25R with a length of 2700 m was built, the so-called northern runway. 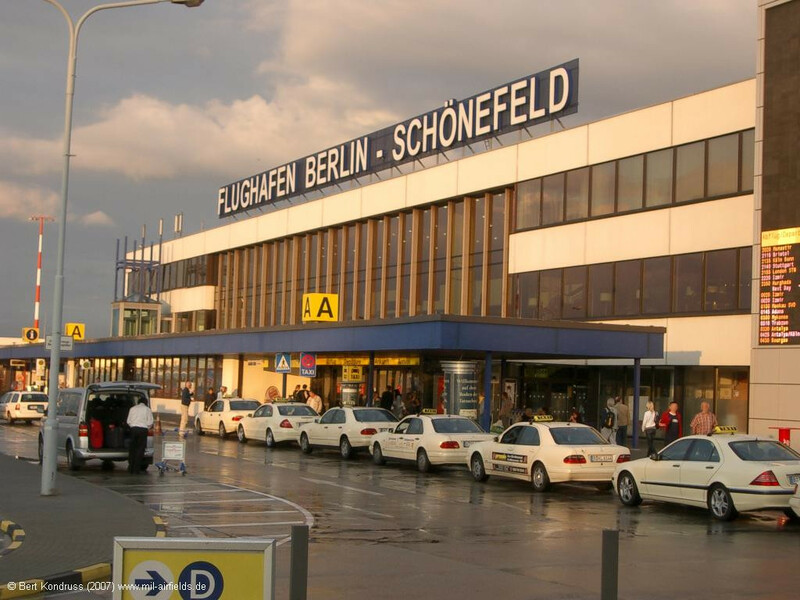 Schoenefeld became the most important airport of the GDR and home base of the airline Interflug. 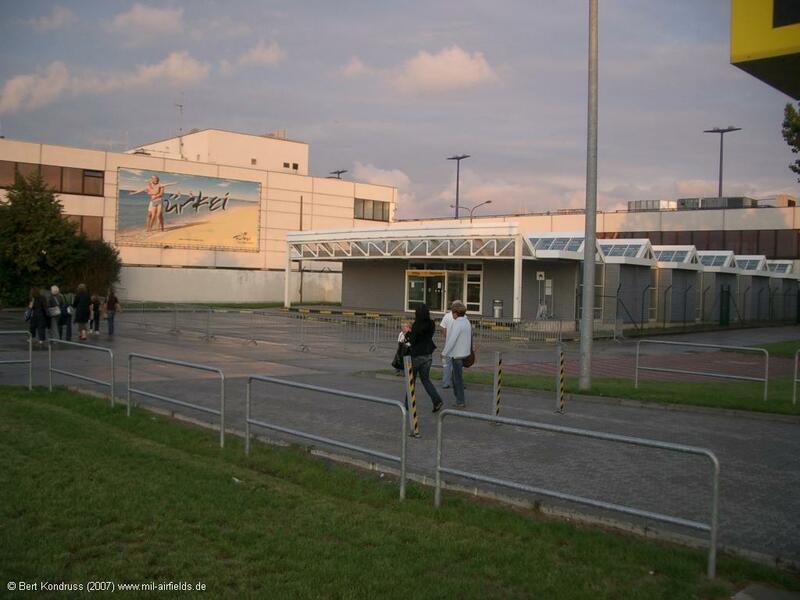 In the 1970s, the "New Passenger Terminal" (Neue Passagierabfertigung, NPA) was built, which went into operation in 1976 and served all international flights. It is the basis for today's Terminal A. The previous check-in in the Henschel training workshop was continued to be used for domestic flights until 1980. 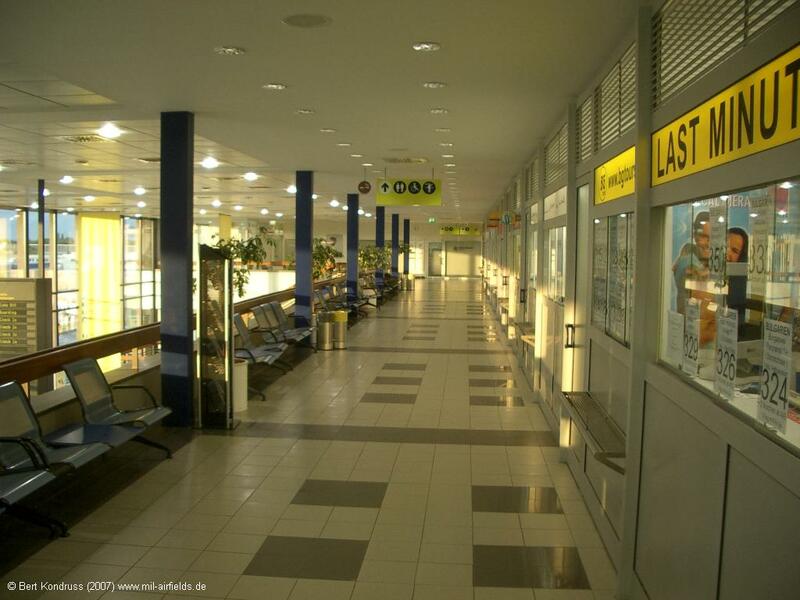 In the mid-1980s, the NPA was supplemented by the "Extended Passenger Terminal" (Erweiterte Passagierabfertigung, EPA). 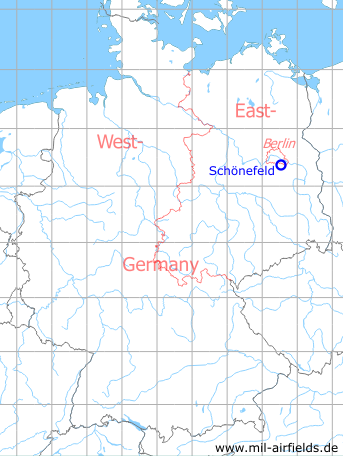 Because of its location close to Berlin, Schoenefeld was often the starting and ending point for flights by the GDR's party and state leadership. The aircraft used for this purpose belonged to the Transport Aircraft Wing 44 (Transportfliegergeschwader 44, TG-44, designation in the 1980s), which was stationed at Marxwalde Airfield (now called Neuhardenberg again). These were usually military registered passenger aircraft of the types Il-18, Tu-124, Tu-134 or Tu-154. To disguise the identity, they used colours of the airline Interflug. At the beginning of the 1980s, the TG-44 received three long-range aircraft Il-62, which were stationed in Schoenefeld. 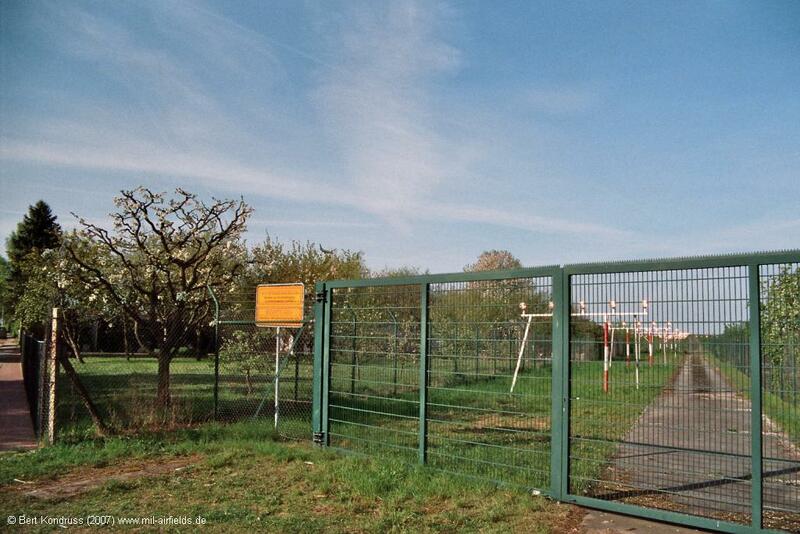 A separate parking area was created for them in the southern part of the field, accessible via taxiway N.
The helicopter squadron of the East German People's Police and the aircrafts of the Ministry of State Security were also stationed at the airport. The latter operated two Tu-134 aircraft in the colors of Interflug in the 1980s, which were used, for example, to repatriate captured refugees from Hungary. 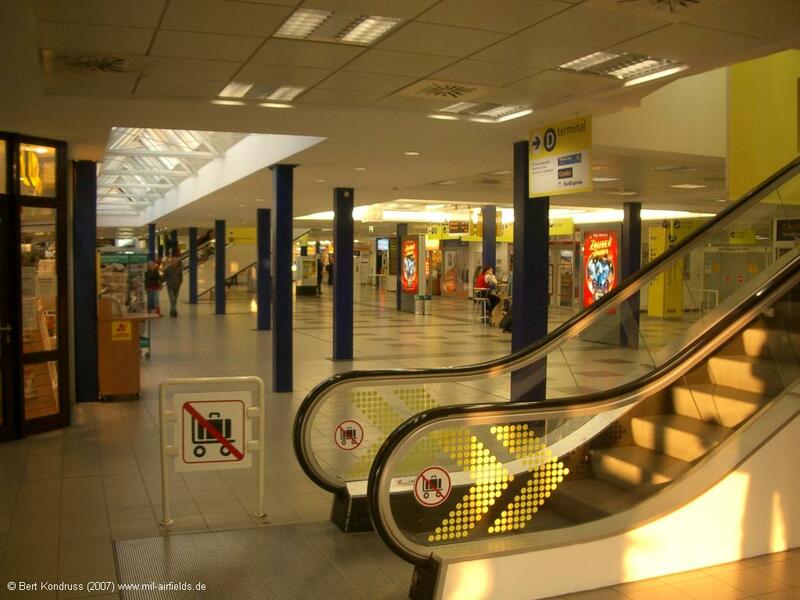 After the reunification, Interflug's flight operations were discontinued and numerous foreign airlines relocated to Tegel Airport. 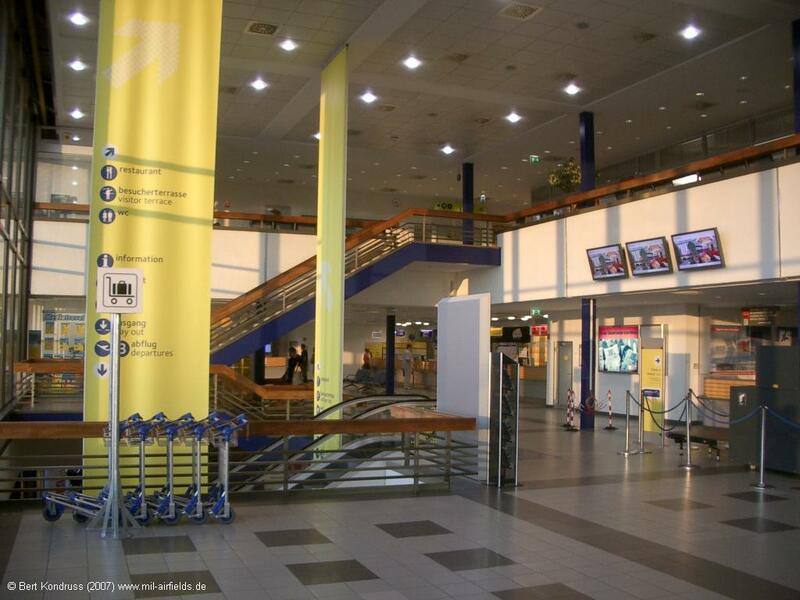 At first, it became quiet around Schoenefeld, until the airport was discovered by low-cost airlines. 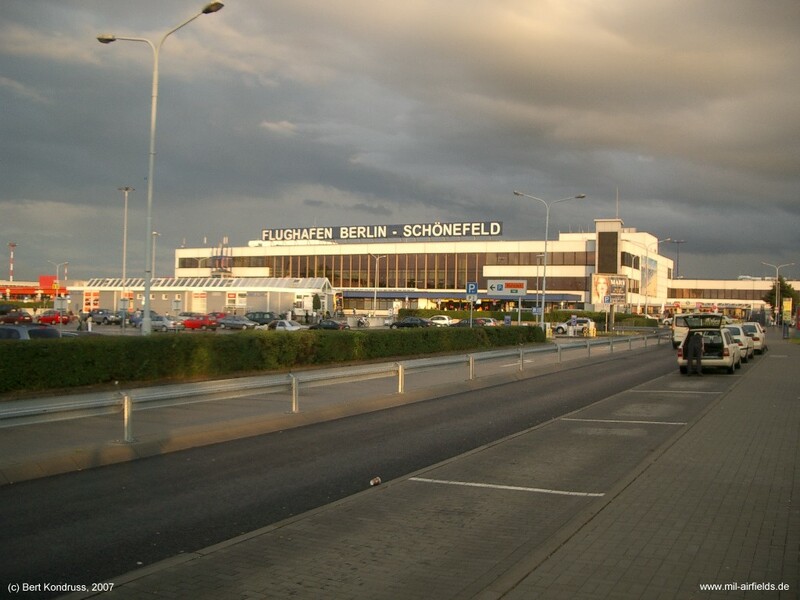 In 2006, construction work began on the south side of Schoenefeld Airport to build Berlin-Brandenburg BER Airport. It will use the existing southern runway as the north runway. The previous north runway 07L/25R was closed in 2007. Airfield of Henschel aircraft factory. Used by Soviet forces. Later international airport for East Berlin and home base for East German Deutsche Lufthansa and Interflug respectivly. Base for Il-62 of Transport Wing 44 (TG-44 / TFG-44) of East German Air Force (LSK/LV) for VIP transport. Order No. 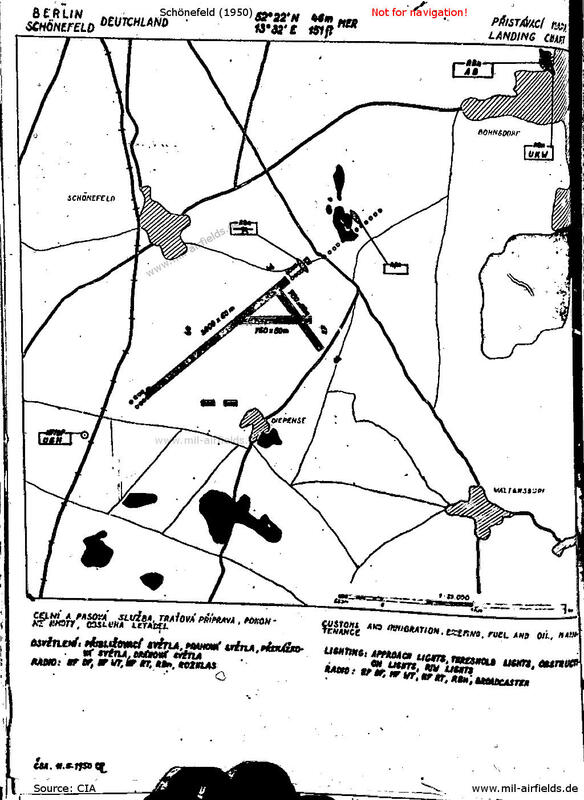 93 of the Soviet Military Administration of Brandenburg dated 21 May 1947 to expand Schoenefeld Airport. 1. Extension of the concrete runway and landing strip by 1,100 meters so that the total length of the strip will be brought to 2,000 meters, and the construction of a taxiway from the end of the runway to the aircraft parking site. 2. Lighting facilities for a take-off and landing strip required for night take-offs. 3. Leveling work on the site to be added to the field. 4. Construction of a radio transmitter and a DF station. 5. 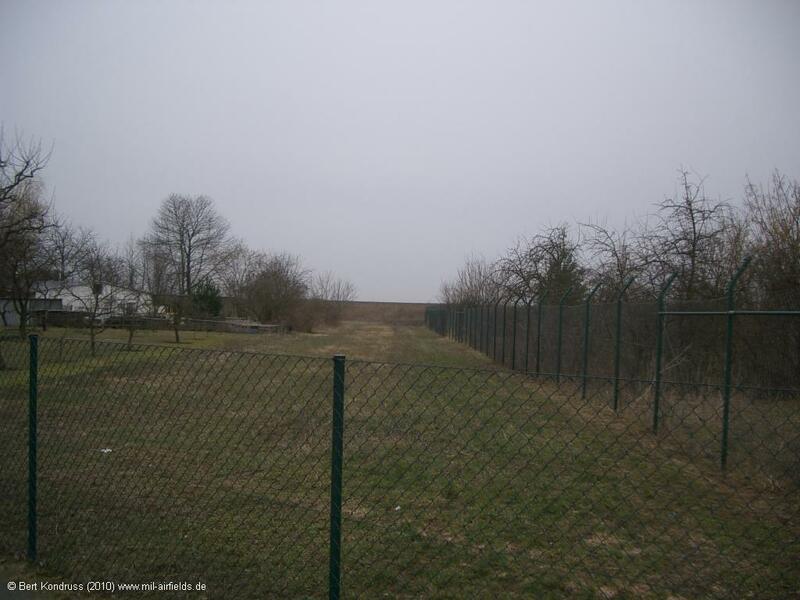 Enclosure of the airfield..
6. Construction of approach roads. 7. Reconstruction, re-equipment and repair of the buildings serving passenger traffic, of the hotel, restaurant, clubhouse, and of 120 housing units. 8. Clearing of the airfield area of debris after completion of the dismantling of objects. 9. Completion of projected work. 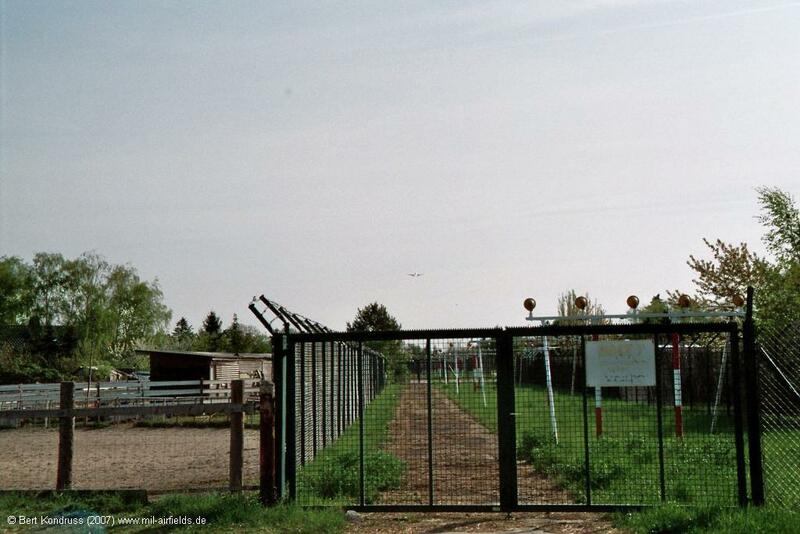 Agricultural land belonging to the communities of Diepensee and Schoenefeld was expropriated for the airport. Lieutenant Colonel Stolyarov has been appointed director of the airport. a. 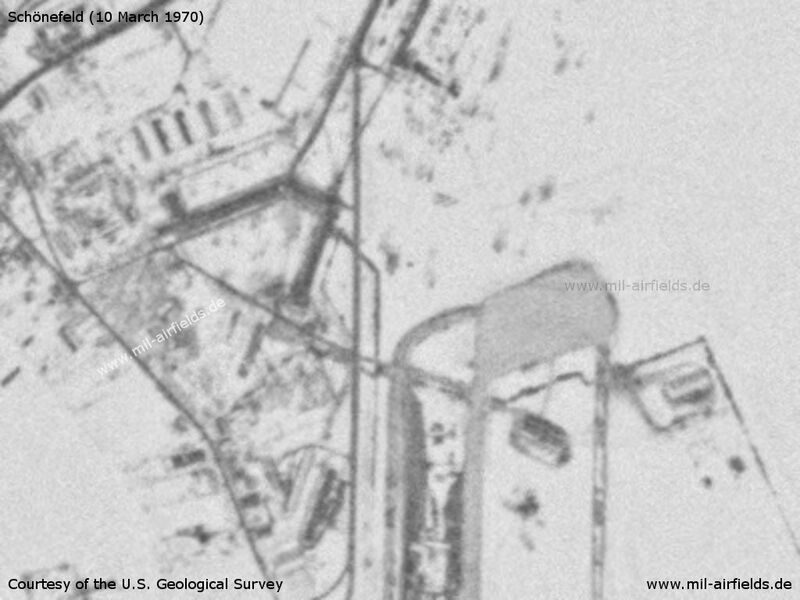 ... All activity has been transfered from Adlershof to Schönefeld and the former field has been dismantled for the most part, although it is still being used by U-2 courier aircraft. b. 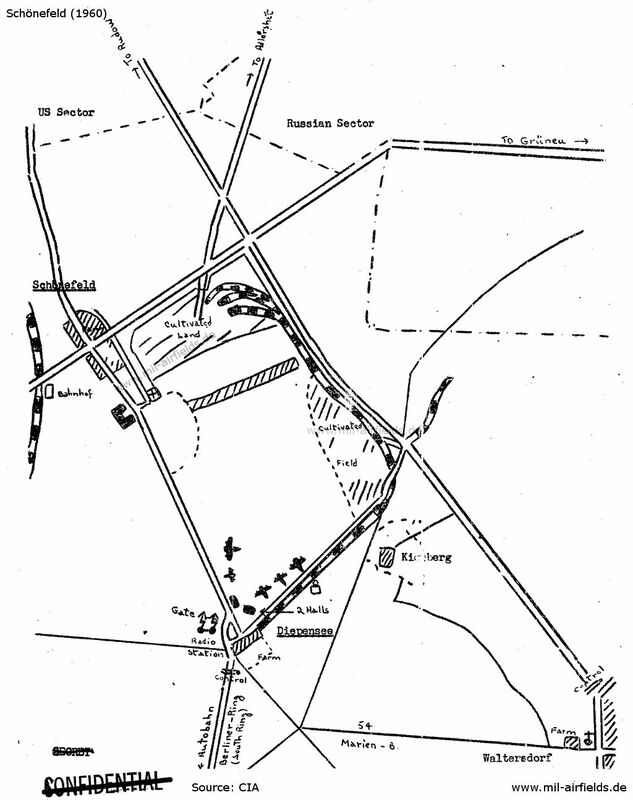 The field's chief entrance is at its southern extremity and is reached through Diepensee, where there is a Soviet control point. 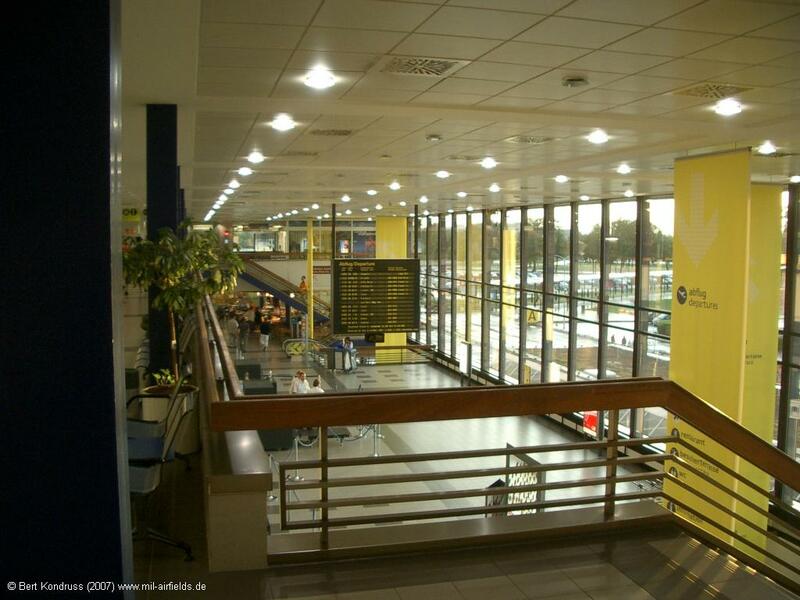 A sign at this entrance reads "Aeroport Berlin". Signs posted along the footpath between Diepensee and Waltersdorf read: "Trespassing forbidden under penalty of law and 500 marks fine. Soviet Army Unit No. 68061." c. The field is grass covered, the ground is hard. The concrete runway, running southwest to northeast, is sixty meters wide and approximately 800 meters long. Apparently the runway is being extended by 100 to 150 meters as part of the improvements being made in the northwest area of the field. d. The field contains a control tower, two hangars, a small building with direction finding equipment, and a radio station with two masts, each approximately thirty meters high. e. The Siemens-Bauunion is reconstructing various buildings. FInal dismantling operations on the Henschel plant are controlled by the "Sonderbaubüro IV für Bauten der sowjetischen Besatzungsarmee bei der Stadtverwaltung Potsdam". f. The field appears to be used at the moment only for transportation and mail services. Five PS-84 aircraft observed on 26 July bore camouflage paint minus the usual Soviet star; left side of fuselages and upper left side of wings were marked СССР; right side of fuselages and wings were marked Л 4076. 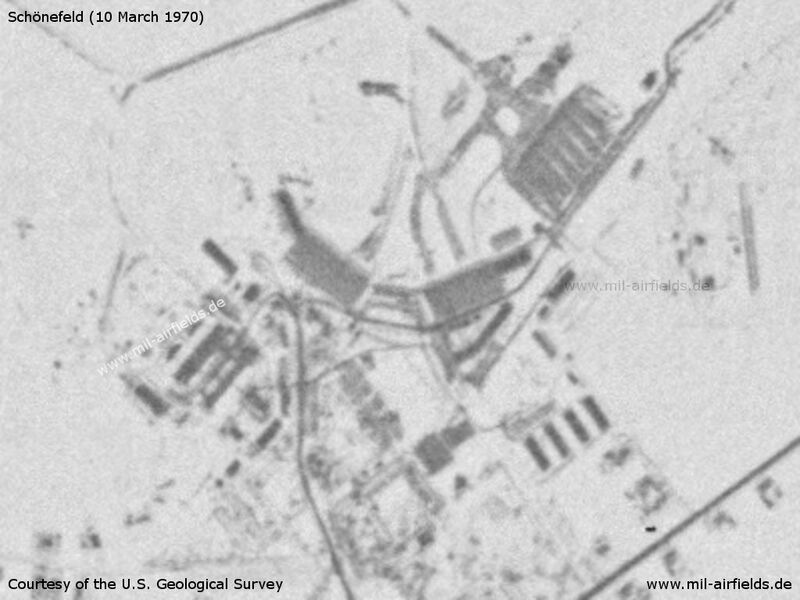 During the past month the Russian airfield at Schoenefeld (Z93) has undergone extensive enlargements, reportedly in connection with the recent increase in the amount of air traffic between Berlin and Moscow. 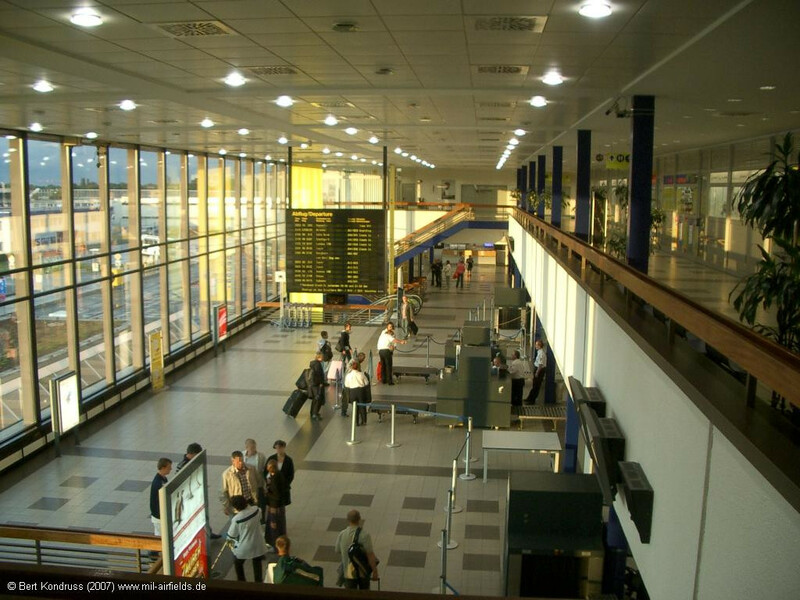 This increase is due to the fact that the Russian-operated air lines, which formerly confined themselves almost exclusively to passenger service, are now carrying large amounts of freight, particularly watches, light metal products, and optical instruments, produced in the Russian Zone. The change-over, which has occasioned an almost six-fold expansion in flight capacity, was necessitated by the looting and robbery of Russian freight trains and trucks in Polish territory. a. 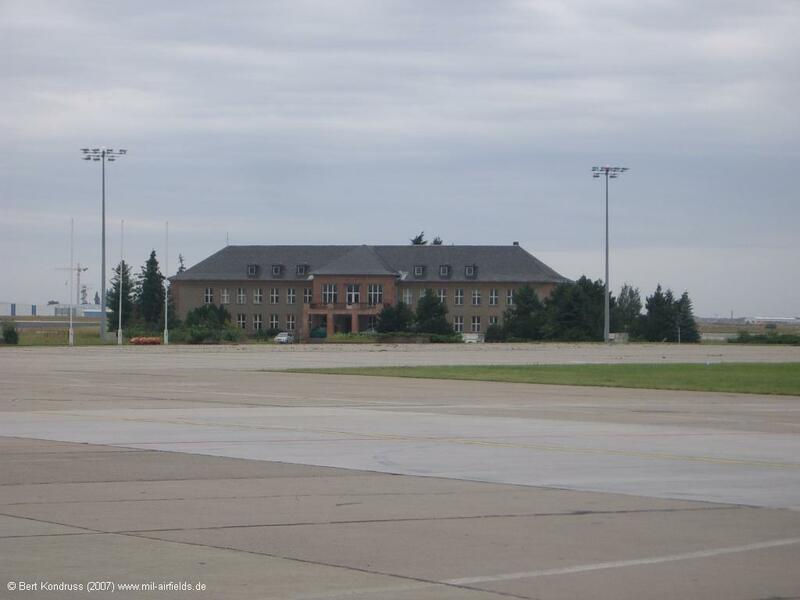 Except for the arrival of one transport, whose civilian and military passengers went to Berlin, there was no air traffic at Schönefeld airfield on 30 August. Four other transports were seen on the field, and there were eighteen tank cars on the railroad siding. b. Two hangars and an operations tower are working. 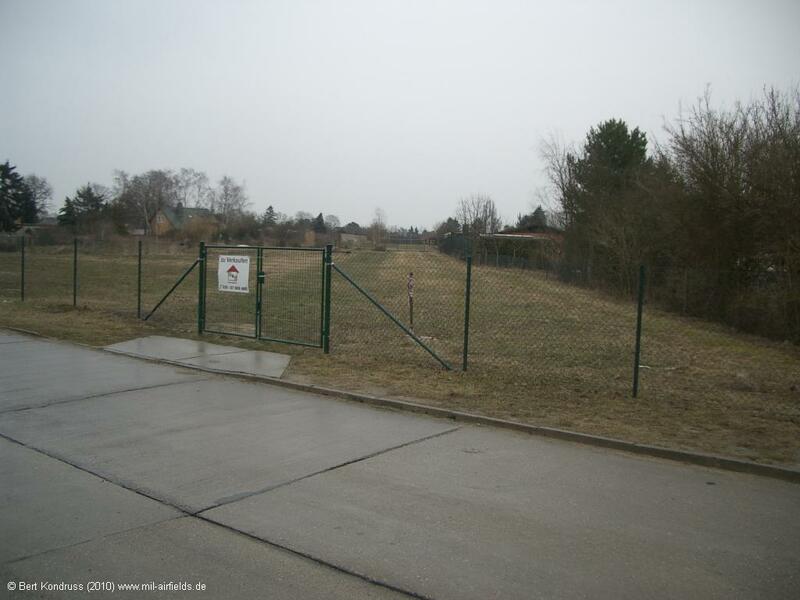 Field buildings on the Diepensee farm are being repaired, but former barracks near the airport are not in use. c. The grass runway is in good shape. A concrete runway, running northeast-southwest, 30-40 meters wide and 1.8 to 2 kilometers long, has been finished; and a field ring is nearing completion. d. There is a signal sender off the runway at the southwest end of the field. Behind the hangars are two radio stations, one fixed and one mobile. e. A wire fence encloses the southern and northeastern side of the field; otherwise there are only signs against trespassing. 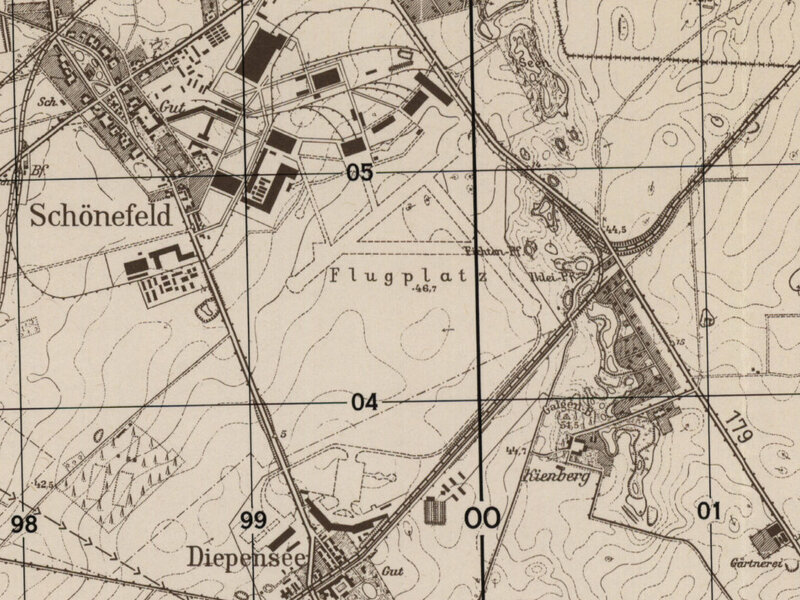 f. The Schönefeld-Diepensee road has been obliterated by the extension of airfield boundaries. A rail line is being laid down on the old main approach from the Rudow-Waltersdorf highway and a new street is being set out parallel to it. Comment: Schönefeld flying hazards are represented by a large chimney still standing on the field and, possibly, the radio masts at Königs Wusterhausen. It was learned early in July 1949 that the unit ... stationed at the Schoenefeld airfield, had requested a shipment of hay from the Rangsdorf (N 53/Z 82) supply office in March 1949. 2. The plane was not at the field on 9 June 1949. Comment: The plane mentioned probably was an Il-18. ... the plane was assigned to the "Aeroflot" Airlines. It is not known what route this plane was flying. 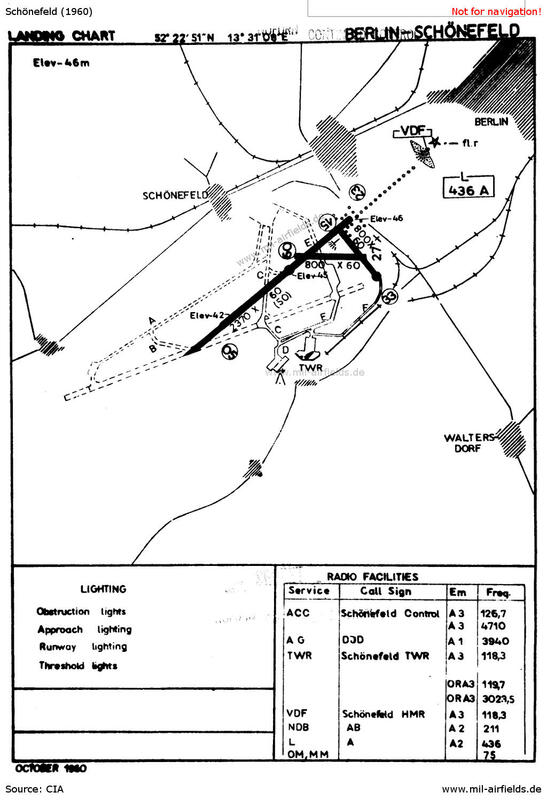 The two transport aircraft which formerly landed at the Schoenefeld (N 53/Z 93) airfield every evening did not arrive on 19 and 20 June 1949. * One four-engine plane of the same type as observed on 7 June 1949 landed on 21 June 1949. ** Quartering buildings at the airfield were still being improved. * Comment: Since the exact landing times of the two transport aircraft which previously landed at the field every night, were not stated, it cannot be determined to which airlines these planes were assigned. 16 August 1949: A biplane took off at 9 am and a twin-engine biplane landed there at 12.45 pm. The scheduled DC-3 arrived at 5:30 pm. Three other twin-eninge transport aircraft landed in succession about 11 pm. 17 August 1949: A single-engine plane landed at 1:35 pm. There was no other flying. A truck ... and a passenger car ... were observed. No aircraft or soldiers were seen at the field. The hangars were closed. 18 August 1949: A biplane circled the field from late evening until after midnight. Red and green signals were fired from the biplane. Soon afterwards the report of a heavy gun was heard from the east. 19 August 1949: Three twin-engine aircraft took off from the field and headed east at 7:45 am. The lower sides of the planes were painted light blue, the upper sides dark green. Construction work on the hangars and field buildings was still in progress. Comment: Report shows that no air unit is located at the SCHOENEFELD airfield, which is used only by commercial aircraft and transport aircraft. The construction work at the northern section of the airfield is apperently not yet completed. 22 August 1949: Two Dakota type aircraft landed about 4 pm. One of these planes carried the number 4243. The construction work at the field continued. 25 August 1949: Seven commercial aircraft landed at the field in the morning. According to the porter at the field, Soviet delegations to attend the Goethe festivals in Germany had arrived in these planes. No air unit was stationed at the field. 19 September 1949: Seven twin-engine transport aircraft were parked on the south-western edge of the airfield. Another plane of the same type with silver paint and a light blue stripe on the rudder assembly landed at 12:15 pm. Motor vehicles ... were observed. Construction work was still being done. The field was guared by the "People's police". 28 September 1949: Four twin-engine transport planes, presumably DC-3s, were parked near the two hangars on the southern edge of the airfield. ... Construction work was being done on the spur track. 15 November 1949: Two passenger planes, probably DC-3s, landed at the field. 17 November 1949: A passenger plane of the same type ... landed at the field. 18 November 1949: No aircraft, Soviet Air Force soldier or military motor vehicles were observed at the airfield in the afternoon. The field was guarded by sentries and patrols of the Soviet Zone German police. Some railroad tank cars were standing near the fuel dump on the southern edge of the field. 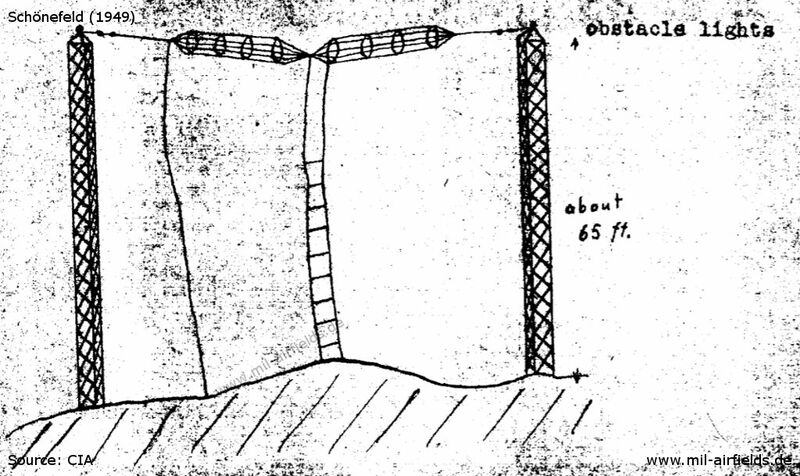 A radio station stood beside the buildings on the southern edge (for antenna system see sketch 1). 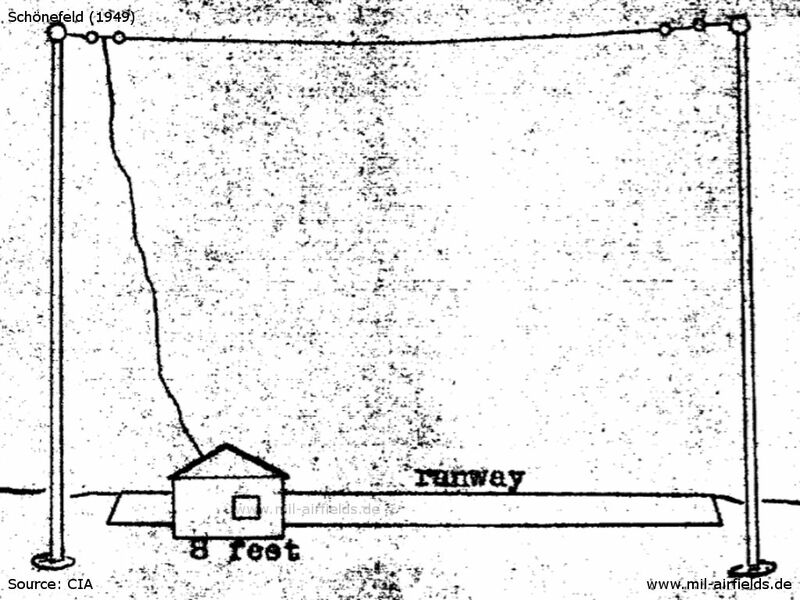 Another radio station stood north of the east end of the concrete runway (see sketch 2). 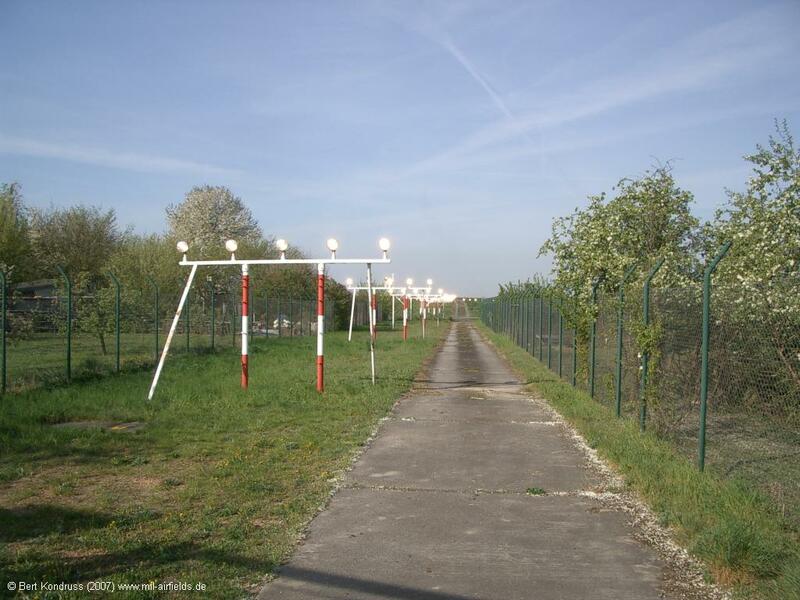 A set of lamps was seen at the extension of the runway to the east. Boundary lights were ... available... Railroad spur track led to the buildings on the northwest edge. Signboards to the field had inscriptions such as "Airfield" and "To Intourist Hotel". A twin-eninge passenger plane ... landed at and took off from the field between 21 and 27 November 1949. Four or five of the described twin-engine passenger planes were parked in the hangar on the southern edge. The planes often made local flights, probably in connection with instrument approach flights, between 6 pm and midnight, sometimes in very hazy weather. Colonel SKRIPNIK was the CO of the field. Soviet officers, some of them pilots with their dependants, were quartered in the dwelling houses at the field. There were boundary lights on the eastern and western edges of the field in line with the runway. Obstacle lights were on the neighboring buildings. 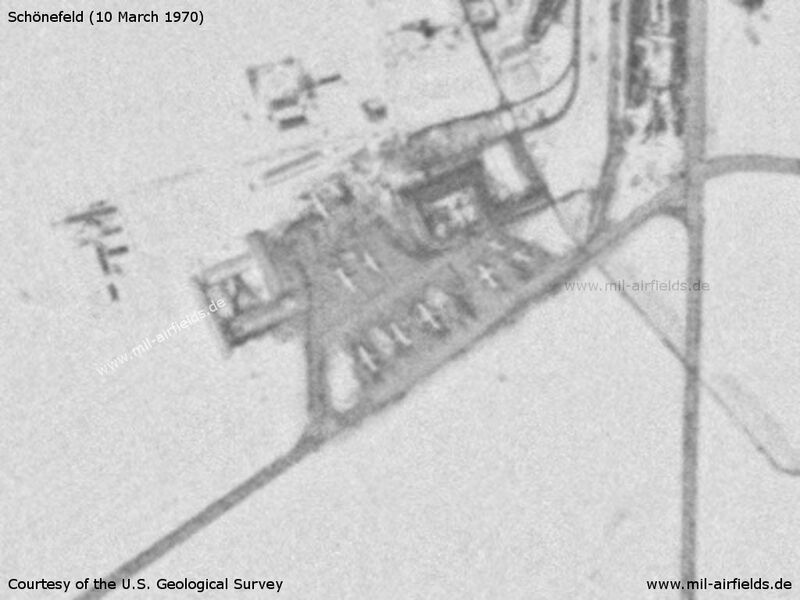 There was a DF station about 1,600 feet west of the runway surrounded by four radio masts which were interconnected by antenna wires. Another radio station was stood the flight control station. The entire airfield was serviceable for night flights and instruments landings. It was rumored that the quarters at the field, now occupied by Soviet dependents, were soon to be used by air force troops. Comment: The report confirms the previous assumption that the field is used by civilian airlines. No air unit was stationed there. Colonel SKRIPNIK, reportedly CO of the field, is possibly Maj SKRIPNIK, CO of the Alt Lönnewitz 345th ATB (formerly 67th ATB) (Avio Technical Battalion) from 1946 to 1948. 09 December 1949: No aircraft were parked outside the hangars. As it rained heavily the boundary lights, the runway lights and the row of lamps along the eastern expansion of the runway were switched on at 03:18 pm. A twin-engine DC-3 with a vertical black stripe on the rudder assembly and a black marking on the nose glided in from the east and landed at the field at 03:20 pm. After it had been towed to the northern edge of the field at 03:25 pm, the lights were switched off again. Railroad tank cars were near the fuel dump on the southern edge of the field. There was intensive motor vehicle traffic between the field buildings. The red obstacle lights were on in the evening. A beacon light in the approach flying lane, east of the mentioned row of lamps flashed alternately a dash and four points. Absturz eines sowjetischen Flugzeugs in der Nähe der Kirche von Berlin-Bohnsdorf. 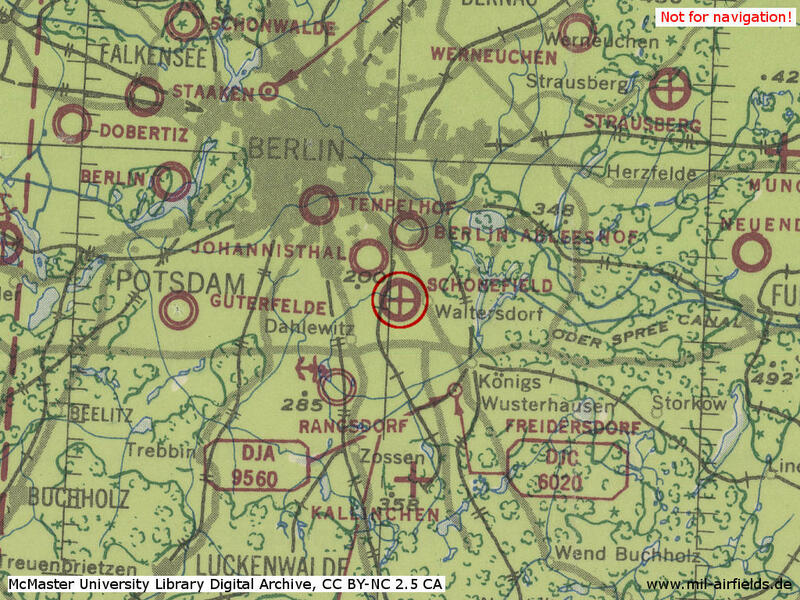 The map and the aerial picture from the East German field manual "A 042/1/003 Auswertung von Luftbildern" from 1973. Possibly for the purpose of disguise, they were printed upside down. 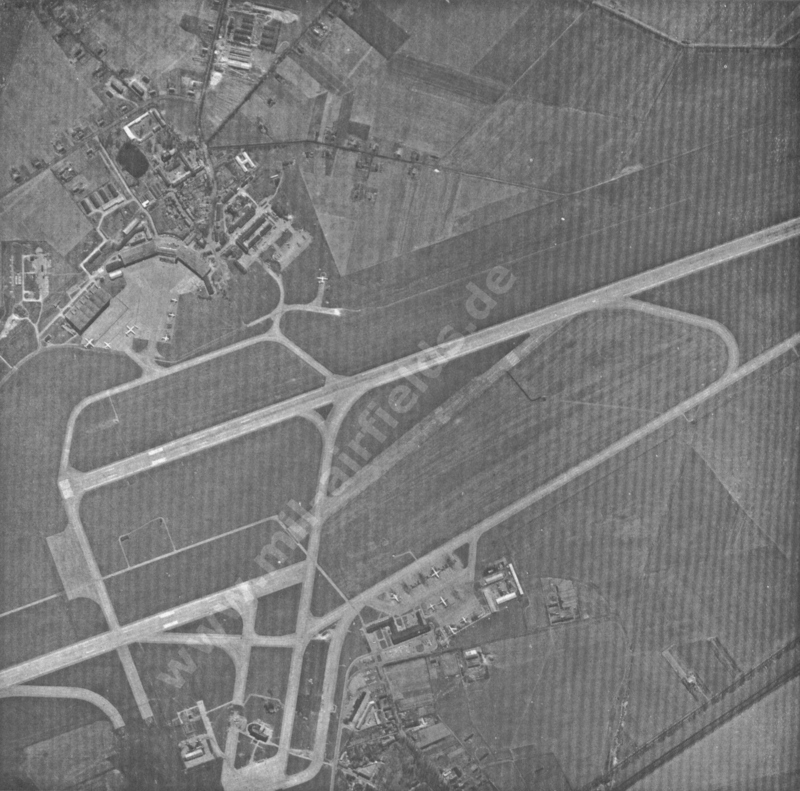 The former northern runway (top right) seems to be completed, so the picture is possibly taken after 1965. The parallel taxiway K does not exist yet. The remains of the old runway still show markings (center of the picture). On the northern apron some aircrafts can be seen: two Il-18 (? ), one Il-14 (? ), one An-24 (?) and two passenger jets with rear engines. On the southern apron (shown on top) two Il-18 (? ), one An-24 (?) and 4 other aircrafts. 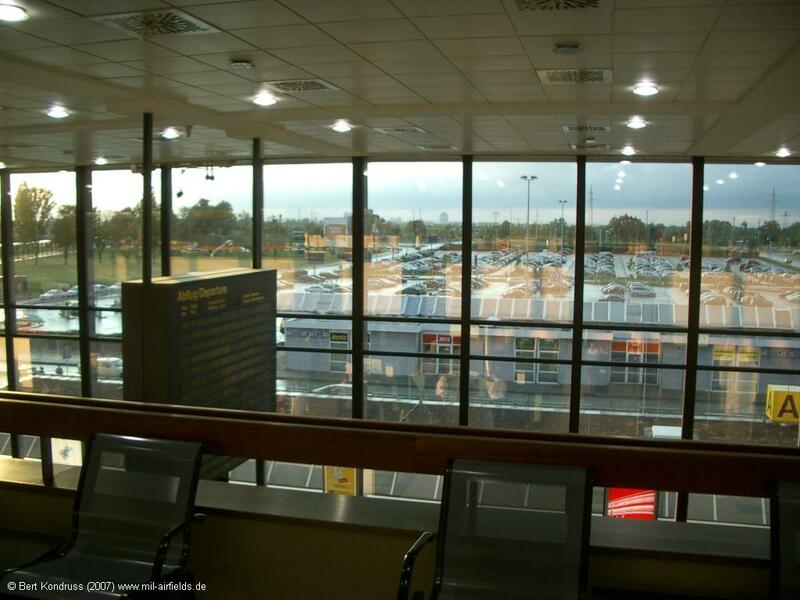 The approach lighting system is left of the approach course consisting of 13 lights orange/red. 5 lights orange were placed across the runway to represent the artificial horizon. Intensity is 1000 W.
Up to the threshold lights the apron is marked by 4 red lights on either side. The touchdown point is marked by a white landing T. The threshold lights of runway 23 are 150 m inward the landing runway, green shining. The distance between the lights is 50 m on all runway. There is neither an approach lighting nor a horizon on this landing direction. The apron is 363 m up to the threshold lights (green shining) and is marked by 6 red lights on the left side and 4 red lights on the right side of the runway. 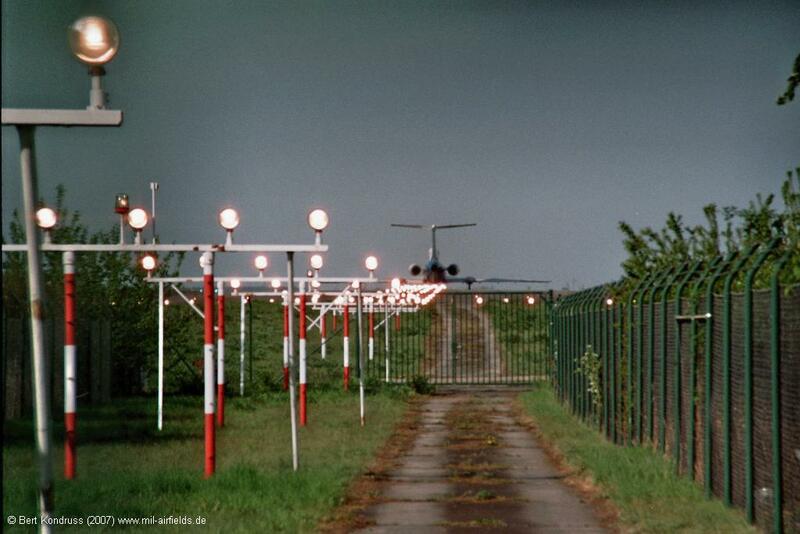 The take-off point for jet or turboprop aircraft is at the red double lamps placed 200 m before the threshold lights. Near the red double lamps a cross-strip of 1 m is marked. The landing T is marked by white lamps. The taxiway being in operation is marked by blue lights. Die Start- und Landebahn I erhält eine Calvert-Anflugbefeuerung. En-Route Radar (RSR) and Aerodrome Surveillance Radar (ASR) in the western part of the field. Precision Approach Radar (PAR) for runways 07R/25L and 07L/25R. 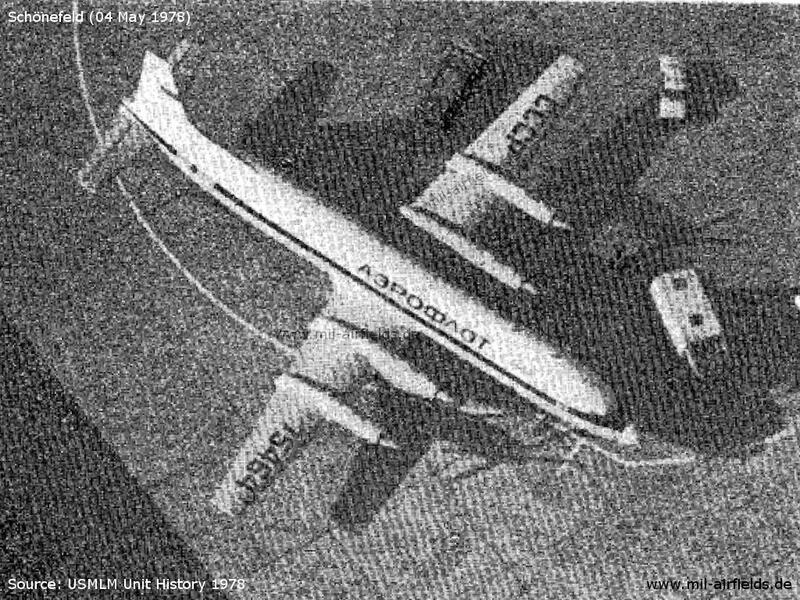 Absturz der Il-62 DM-SEA der Interflug bei Königswusterhausen. Das Flugzeug war in Schönefeld gestartet und kehrte wegen Steuerproblemen zurück. Inbetriebnahme einer neuen Werkstatt zur Wartung und Instandhaltung von technischen Ausrüstungen. Tu-134 DM-SCM der Interflug verunglückt bei der Landung. Montage eines 60 m hohen Mastes zur Messung von Windscherungen 500 südlich der Landebahn. Die Montage erfolgte mit einem Hubschrauber Mi-8. 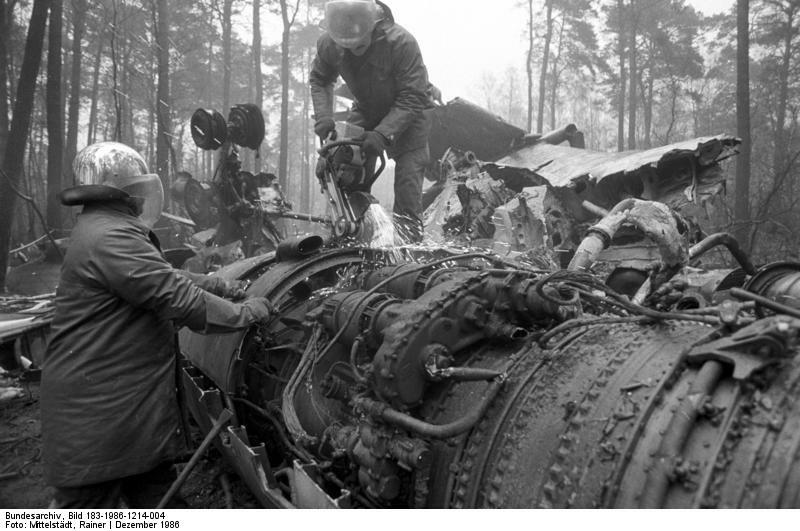 Keine Aufnahme von Il-62 in den Bestand. Bei Bedarf werden Flüge von der Interflug durchgeführt. An Il-18 in Aeroflot colors on 04.05.1978 at Schoenefeld Airport, presumably used as a telecommunications center. The former main runway 05/23 was put out of operation ca. in 1964. 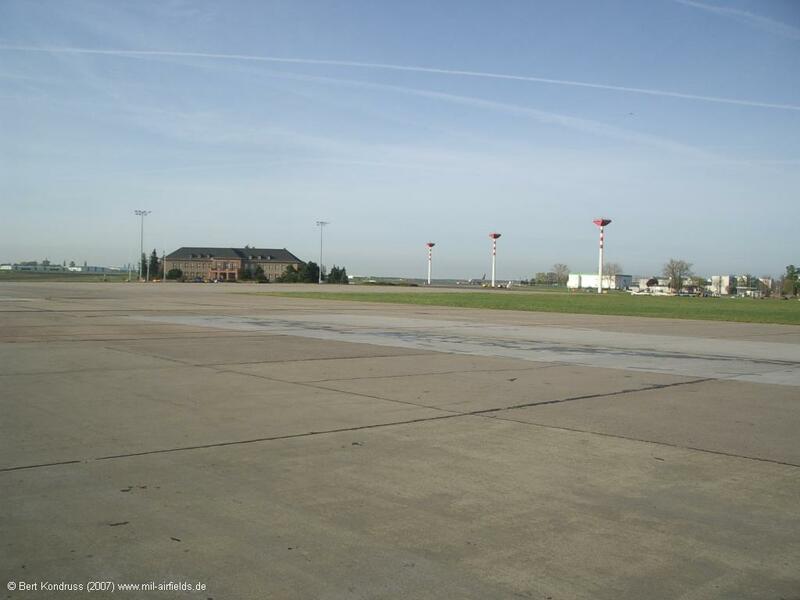 A part of it was still available as taxiway C and was used to park aircrafts. 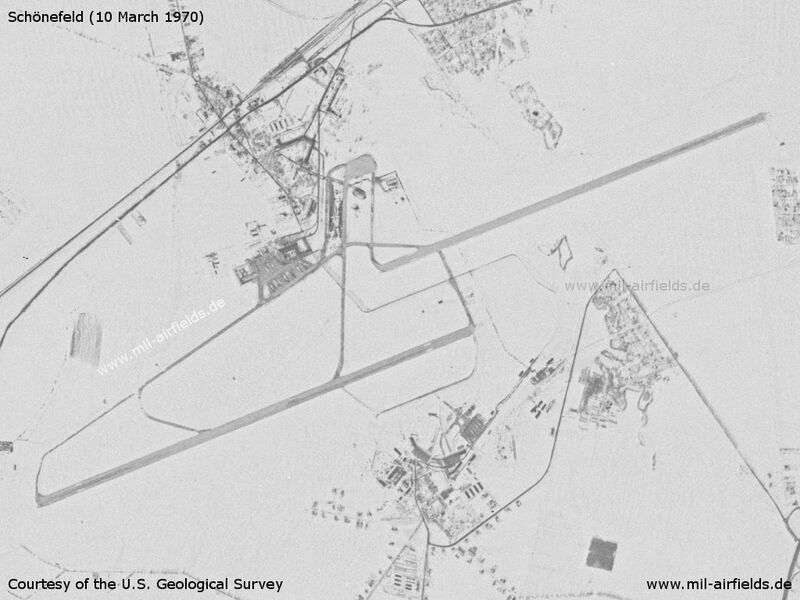 Runway 25L was equipped for category II operations from approximately the end of the 1970s. The take-off positions for 07R and 25L were displaced for about 200 m. The full length could be used on request. 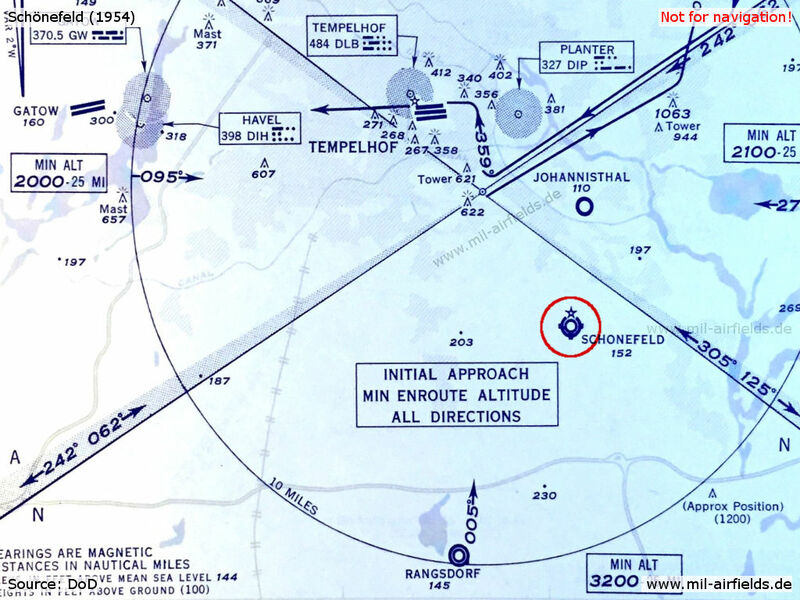 Taxiway K to runway 25R was closed for aircraft with a wingspan exceeding 50 m, except for DC-10 and Il-76. ASR south of the field, PAR for runway 07L/25R. The Soviet radio post was working on 4150 kcs with the call sign BELKA. The HF radio station "Interflug Berlin" was also used by aircrafts of the military transport wing TG-44 for phone patches to their command post. Inbetriebnahme des Flugsimulators Tu-134 an der Betriebsschule der Interflug. Aufnahme des Dauerbetriebs der Radardatenverarbeitung GAMMA-1. Mit dem Rechnersystem ODRA 1305 werden die Daten des Sekundärradars KOREN verarbeitet und auf Sichtgeräten WPS-10 dargestellt. In den Anfangsjahren gab es Probleme mit der Stabilität des Rechners und mit der Zielverfolgung. Inbetriebnahme des Antihavarietrainingskabinetts an der Betriebsschule der Interflug. Inbetriebnahme der rechnergestützten automatischen Fernschreibspeichervermittlung im festen Flugfernmeldenetz (AFTN) eines franzöischen Herstellers. Inbetriebnahme des Funktionsgebäudes für den Betrieb Fernerkundung, Industrie- und Forschungsflug der Interflug. Modernisierung des Radarkomplexes AVIA-D/KOREN. Einrüstung eines Wetterkanals. Grundsteinlegung für das Fliegertrainingszentrum der Interflug. Absturz der Tu-134 CCCP-65795 der Aeroflot im Anflug südlich von Bohnsdorf. Beginn der Ausbildung im Fliegertrainingszentrum der Interflug. Einrichtung eines Feuerwehr-Übungsfeldes für die praxisnahe Ausbildung. Großflächige Löschversuche zur Erprobung von Methoden der Flugzeugbrandbekämpfung. Probleme zwingen die Il-62 DDR-SEW der Interflug zum Startabbruch. Flugzeug rollte über das Ende der Bahn hinaus und geriet in Brand. Ankunft des ersten Airbus A 310-300 DDR-ABA der Interflug. "Ich hatte Spätdienst (14:00-22:00) und seit einigen Tagen einen neuen Mitarbeiter zum Anlernen an Bord. Mit unserem Sankra 2009 hatten wir gegen 17:00 Uhr einen Patienten in Adlershof nach Hause gefahren und meldeten uns anschließend gegen 17: 20 Uhr bei unserer Leitstelle mit „Hunger“. Nun war gerade unserer Sankra 9 dafür bekannt, dass man uns besser in die Pause entlässt wenn er sich mit „Hunger“ meldet - sonst hatten wir nur schlechte Laune und waren zu nichts mehr zu gebrauchen (etwas übertrieben gesehen). Anstelle einer Bestätigung kam die Meldung: "Signalfahrt über Adlergestell auf die Autobahn! Flugzeugabsturz bei Bohnsdorf. Bahn sei gesperrt und Polizei weist uns ein." Ich fragte noch ob das ein Scherz sei, aber da wir keine Antwort darauf erhielten wurde uns mulmig. Mit Fernlicht und Sondersignal rasten wir über das Adlergestell in Richtung Absturzstelle. Das erste Mal in meiner ganzen Zeit als Fahrzeugführer sah ich Polizisten, die sich im fließenden Verkehr vor die Autos stellten, um uns die ungehinderte Durchfahrt zu ermöglichen. Wir rannten also durch den schon dunklen Wald in Richtung Feuerschein. Das Bild dieser Unglücksmaschine hat sich bei mir eingebrannt und selbst nach gut 24 Jahren habe ich sie vor Augen. Tote und Verstümmelte vor und in der Nähe des Wracks... Film und die Wirklichkeit sind jedenfalls nicht vergleichbar! Überlebende oder Verletzte hatten wir keine mehr gefunden. Die überlebt hatten, wurden von der Feuerwehr und anderen Rettungswagen schon abtransportiert. Auf der Autobahn zurück, fand ein heilloses Durcheinander statt. Polizei, Feuerwehr und Rettungsdienst – jeder machte seins. Eine Koordinierung der Einsatzkräfte hat anfangs nicht stattgefunden. Für unsere Einsatzbereitschaft erhielten alle Beteiligten ein Dankesschreiben." 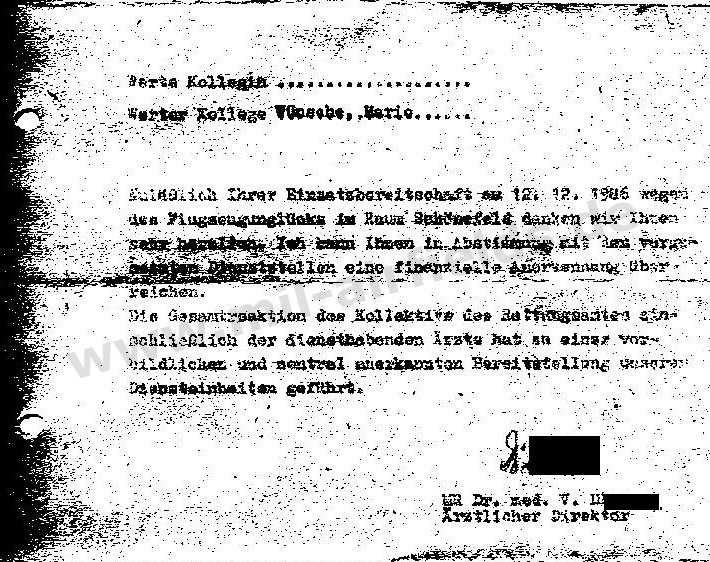 Text "Werte Kollegin / Werter Kollege ... Anläßlich Ihrer Einsatzbereitschaft am 12.12.1986 wegen des Flugzeugunglücks im Raum Schönefeld danken wir Ihnen sehr herzlich. Ich kann Ihnen in Abstimmung mit den vorgesetzten Dienststellen eine finanzielle Anerkennung überreichen. Die Gesamtreaktion des Kollektivs des Rettungsamtes einschließlich der diensthabenden Ärzte hat zu einer vorbildlichen und zentral anerkannten Bereitstellung unserer Diensteinheiten geführt. MR Dr. med. V. H. Ärztlicher Direktor"
Mario, danke für diesen bewegenden Bericht! Einsätze des TG-44 der Nationalen Volksarmee (NVA) waren Flüge im Auftrag der Partei- und Staatsführung und begannen häufig in Schönefeld. Die Tu-134 - überwiegend in den Farben der Interflug - starteten von ihrem Stationierungsort Marxwalde (heute wieder Neuhardenberg) und flogen die kurze Strecke nach Schönefeld, um von hier aus den eigentlichen Einsatz zu beginnen. Analog flogen sie auf dem Rückweg zunächst nach Schönefeld und dann zurück nach Marxwalde. Übergabepunkt zwischen Schönefeld und Marxwalde war jeweils das Funkfeuer Fürstenwalde (FWE). Ende der 1980er Jahre wurde dafür eine eigene Abflugroute eingerichtet, die jedoch nicht international veröffentlicht wurde. Für Langstreckenflüge im Auftrag der Partei- und Staatsführung der DDR wurden drei Il-62 beschafft, die im TG-44 der NVA eingesetzt wurden, aber in den Farben der Fluggesellschaft Interflug verkehrten. Für diese Flugzeuge wurde Anfang der 1980er Jahre auf dem Südteil des Flugplatzes eine eigene Abstellfläche errichtet und über den Rollweg N angebunden. - Stationierung der Flugzeuge in Marxwalde unzweckmäßig; Flugzeuge und Reserve- und Sicherstellungstechnik müssen bereits am Vortag überführt werden, was großen Aufwand bedeutet. Zur Versorgung der Arbeiter an der Erdgastrasse gab es in den 1980er Jahren mehrmals pro Woche Flüge von Schönefeld nach Lvov. Dazu flogen am Morgen z.B. drei An-26 der TS-24 von Dresden und eine Tu-134 des TG-44 von Marxwalde nach Schönefeld. Von hier starteten sie in Richtung Erdgastrasse und kehrten am Abend nach Schönefeld zurück. Dann ging es wieder zurück nach Dresden bzw. Marxwalde. - Arbeitsbereitschaft für Teilaufgaben ab Mitte 1989 in den Räumen der ehemaligen Flughafenabfertigung (Ausbau- und Ausrüstungskosten ca. 500 TM). One of 2 airports for Berlin. Reconstruction of a new airport Berlin-Brandenburg International (BER). In 2007, the so-called northern runway 07L/25R was taken out of service. The following pictures were taken a few days before closing. 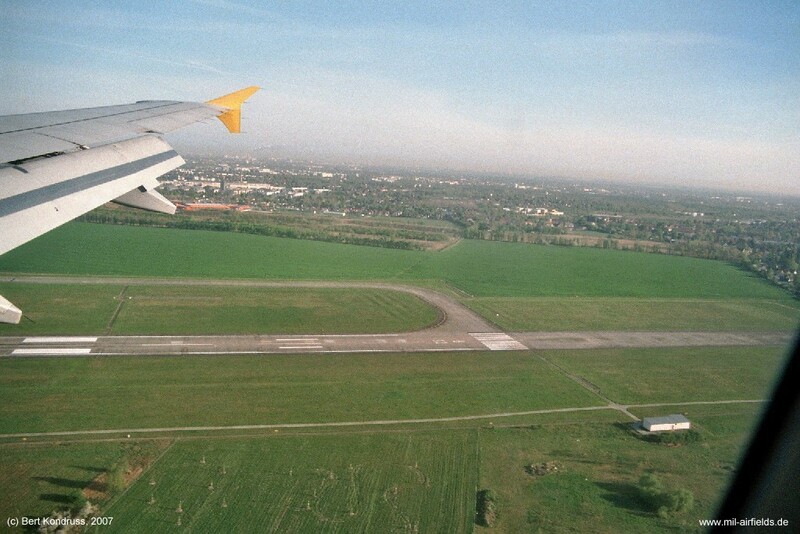 The beginning of the former northern runway 25R shortly before going out of operation in 2007.